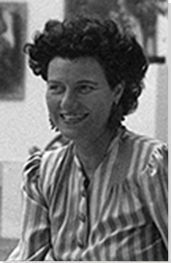 The below artworks are the most important to Peggy Guggenheim - that both overview his approach on what makes good art, and highlights his theories on the greatest achievements by these artists. Artwork description & Analysis: This enigmatic painting depicts a view of a sunlit crenellated tower, its fortress-like circular shape dominating the horizon. 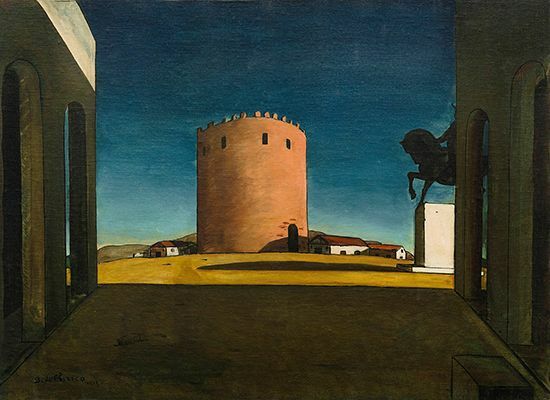 In the lower third of the canvas, a shadowed square between two looming semi-classical walls frames the tower, the strong lines of perspective creating the sense that the viewer is walking through a dark corridor toward its ominous shape. At center right, an equestrian statue on a white rectangular plinth is depicted in black shadow, casting a long shadow across the plane of sunlit ground. The work is reminiscent of an Italian landscape, yet it also evokes a dreamlike feeling. The objects become hallucinatory, as the statue's shadow at first glance can seem like a nightmarish creature looming in wait for the viewer to emerge from the square. The scene is remarkably empty of figures and of movement, while the discordant perspective and irrational light source create a sense of anxiety. Exemplifying the artist's metaphysical style, in this work, as the artist wrote, "every object has two appearances: one, the current one, which we nearly always see and which is seen by people in general; the other, a spectral or metaphysical appearance beheld only by some individuals in moments of clairvoyance and metaphysical abstraction." Artwork description & Analysis: In this painting, regular and irregular geometric shapes, as well as more organic forms, depicted in primary colors, are juxtaposed against an off-white trapezoidal plane, which itself sits in a field of inky black. The shapes seem to both float above the plane and to be grounded within it, creating a dynamic spatial relationship. Some of the abstract shapes evoke symbols, like the number 3, whereas others evoke naturalistic associations - a boat, a lance, a piano keyboard, a checkerboard - but are abstracted to non-referentiality and deployed like colored elemental forms to create visual rhythm. 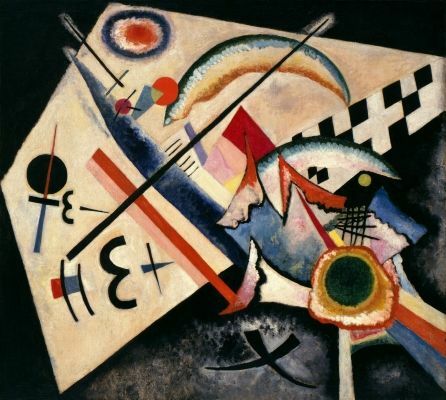 The title refers to the white cross within the checkerboard in the upper right, and the shape is echoed throughout the canvas - in two black crosses in the lower center and the cross handle of the lancet shape intersecting a circle at center left - creating a kind of musical point and counterpoint, as the evocative symbol is treated as an abstract shape. Artwork description & Analysis: This sculpture is a sleek aerodynamic form, evoking a bird in flight, yet devoid of representative details. 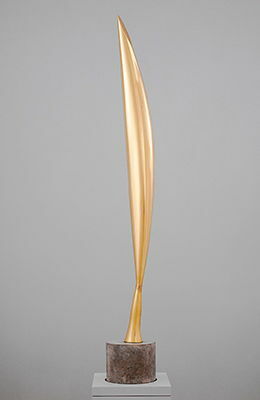 An embodied arc of light soaring upward, from a slender base conveys unfettered movement. The highly polished surface is luminous, as the artist felt that such attention to the material and its surfaces made the works seem to proceed "out from the mass into some perfect and complete existence." Brancusi insisted that the elemental form was not abstract but revealed "the being that is within matter." Artwork description & Analysis: This painting dynamically surges with swirling lines and biomorphic forms that, curving vertically through the pictorial plane, also create horizontal movement that seems to extend beyond the edges of the canvas. The forms, as art critics have noted, suggest "several human figures walking, or possibly birds, or letters and numbers," though the artist was to describe it as "a stampede...[of] every animal in the American West, cows and horses and antelopes and buffaloes. Everything is charging across that goddamn surface." 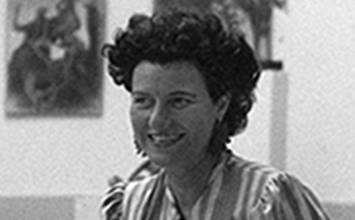 At eight by almost twenty feet, the painting is a pivotal piece in Pollock's career. Art historian Ellen Landau explains that even though it retains Pollock's "mythic imagery," it signals a new scale, and "the areas of loose paintwork give you glimpses of what the future's going to be." The work also pioneered his innovative use of commercial household paints and of applying paint by splashing it onto the canvas. Artwork description & Analysis: This Neoplastic work employs black horizontal and vertical lines creating an asymmetrical grid against a gray background. 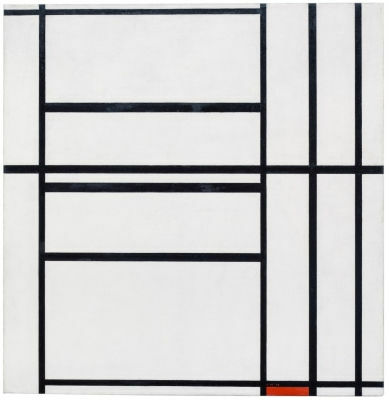 The style, developed by Mondrian, characteristically used a palette reduced to the primary colors along with black and white, but here the approach is even more reductive, with a single note of red deployed in a small rectangle at the bottom of the canvas. The black lines vary in thickness, which interjects an element of unpredictably into the orderly grid and creates a dynamic movement, as the eye moves vertically and horizontally to apprehend a pattern. The work conveys a feeling of severe austerity and, at the same time, becomes an abstract schema of uncertainty and the search for order. Artwork description & Analysis: The elongated female figure on a tilted base, whose arms hang closely by her sides, faces forward, seemingly frozen in space. The bronze surface's rough texture emphasizes materiality, both of the work's medium and of the human body. Capturing the effects of light, the surface also evokes a state of ruin, as if the figure had been torched or sandblasted. As a result, the ghostly figure seems on the verge of dematerializing, or, perhaps, materializing out of a state of near ruin. The work, as art historian Lucy Flint wrote, conveys "several notions simultaneously...one's consciousness of the nonmaterial presence of another person, the insubstantiality of the physical body housing that presence, and the paradoxical nature of perception."